3 What Does This Data Mean? 4 What Does This Data Mean if I am Selling a Home in 2018? 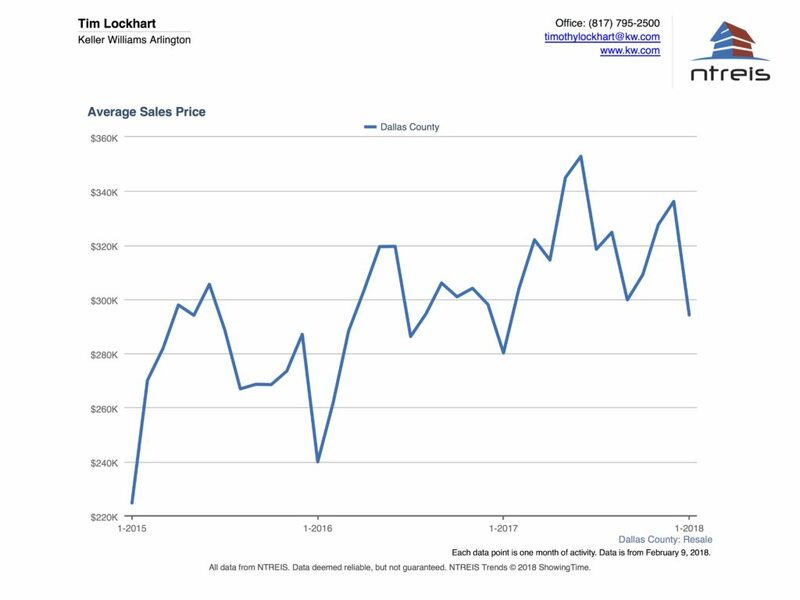 Enjoy this Dallas County Real Estate Market Report for February 2018. You may also search for homes for sale and save your favorite properties. Set up a search and be alerted when new properties matching your criteria come on the market. Here is a look at the Dallas County Real Estate Market for February 2018. 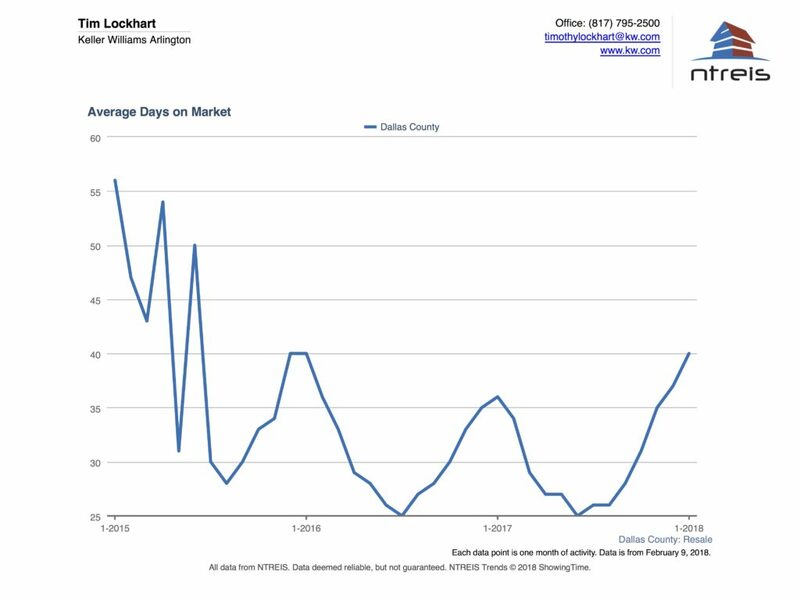 Compared to the same time last year, January experienced a 3.5% decrease in closed sales with an 1.4% decrease in new listings and average days on market of homes for sale in Dallas TX of 40 on market. In the last 3 months there have been 743 single-family home listings expire without being sold. The trend in original list price has increased 5.7% from $450,225 in January 2017 to $475,730 in January 2018 with average list price to sales price ratio at 96.2% indicating that with a monthly increase in home sales, the market price trend continues upward this year. Are we beginning to see a shift in the market? We truly won’t know that answer until a few months after it happens when we can look back and say, ah yes, there was the top. It looked like there was the beginning of the shift last fall, and now prices have started rising again. There are some signs indicating a shifting market, however no one can really know where the exact top of the market is until we look back. We are up month-to-month from a year ago. Bank interest rates are increasing, however they have not risen to the point where they affect home affordability. This could be similar to the downward trend which occurred at the beginning of last year which was short lived only to see the upward trend continue. The new tax law passed in December 2017 won’t affect the average home buyer in Dallas County and might cause people from high-tax states to look to move to Texas. The limit of $10,000 deduction for local and property taxes could affect higher end homes, however if someone is buying a home over $500,000 which is twice the average price, tax savings is probably not the primary driver of their decision. If your realtor is not tracking the market daily, then you might miss the opportunity to obtain top dollar for your home. Now might actually be the best time to sell a home in Dallas TX. Since there are fewer listings in the fall, the actual percentage of homes selling in the 3rd and 4th quarters actually remains fairly constant. Another factor is, many people were recently displaced from Hurricane Harvey and are buying homes in DFW. If you’re considering selling your home in today’s market, contrary to popular belief it takes a lot more than simply placing a sign in the yard and waiting for the phone to ring.